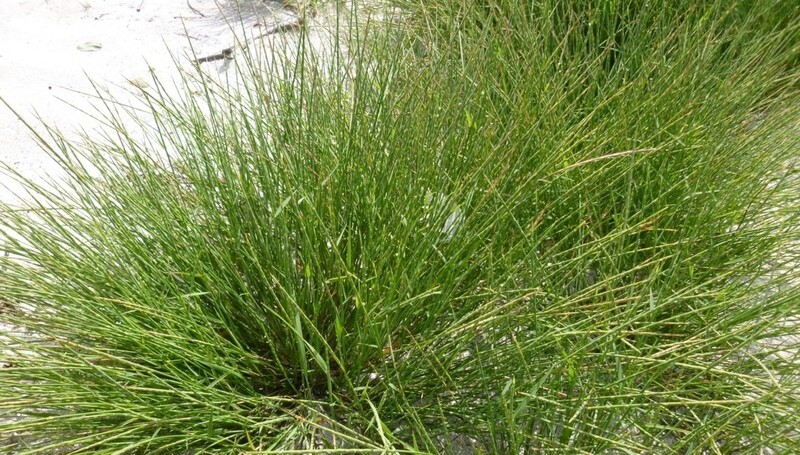 Lepturus is native sedge to Kure. Lepturus cotyledons are long and relatively broad compared to the first true leaves, with a consistent width over most of the length of the blade, then tapering abruptly to a point. The blades have fine but distinct striations. According to historical accounts, Lepturus repens may have never occurred in large numbers on Kure. L. repens has made a significant recovery since the Starr Botanical survey in 2000 when no plants were found. A few plants were discovered in 2002 and spread throughout the island by outplanting. Then the 2011 Japan tsunami distributed the seeds widely along the west coast where it is now abundant as well as on the interior of the island on the north point. Healthy populations continue to persist especially in the northwest quadrant of the island. The range of Lepturus continues to increase as specimens have been found on most beaches. There have been seasonal outplating efforts since 2006 when it was found abundant along the north dunes. This is a very important dune stabilizer because of the fine hair like root structures. After the 2011 tsunami mature plants remained on beaches in mounds of sand captured by the grass on Lisianski and Kure.